Effective Staging Must Use Current Styles and Colors! 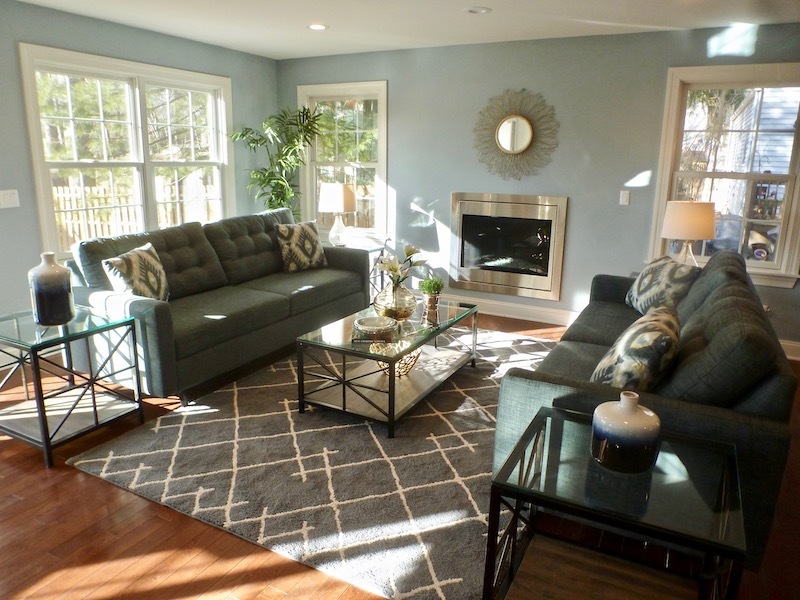 Lately, I’ve been very surprised to see some photos of vacant house stagings in NJ that show shabby-chic, traditional, too-large, or ornate fringed furniture. Frankly, some of it looks like it came from garage sales or from the 1990s! If you’re hiring a stager to either shop for new bedding, carpeting, light fixtures, etc. to update and upgrade your home, or especially for providing furniture and accessories for your home, you may not be aware of what the current trends are, but your stager MUST be for the staging to be worth the money you spend. Traditional furniture doesn’t work for most properties (outside of homes for the elderly), and in our NJ market, very modern furniture doesn’t work either, except in some newer, smaller condos along the Hudson River. Transitional furniture — which falls in between traditional and modern furniture styles — is by far the most popular style today, with its clean, un-fussy lines that buyers prefer. (Check out my vacant staging portfolio to see transitional furniture.) The size and scale of the furniture is also vitally important to enhancing rooms, especially the typically smaller rooms seen in many newer “flip” properties or townhouses and condos. Large, over-stuffed furniture makes rooms look cramped, out-dated, and generally unappealing. Colors matter too — black, red, green, and brown upholstery is mostly out-dated, while gray, white, beige or light gold are much trendier choices that buyers will relate much better to. Shots of either soft, spa-like or brighter colors — teal, all shades of blue, light to jewel-toned greens, orange, even navy — or metallics (silver, gold, bronze) in pillows and accessories are also trendy looks that can help your home look up-scale and current. Again, your stager should be matching the color choices not only to the rugs and furniture but to the wall colors and finishes (hardwood floors, cabinetry, countertops, light fixtures) in the room or adjacent rooms. So be sure the stager you use knows what works in today’s market, your area, and for your demographic. Staging is an investment that will only pay off if the end result is effective!